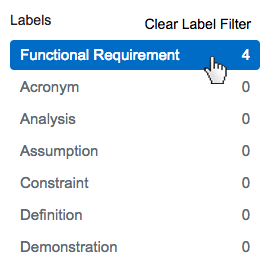 Within an Innoslate Requirements Document, you have the option to filter your document's entities by Class or Label. 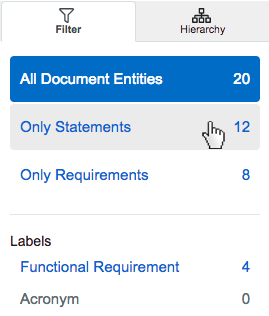 You can filter by schema-based class which entities will display in your requirements document by toggling between 'All Document Entities,' 'Only Statements,' or 'Only Requirements' in the 'Filter' tab of the left sidebar. *Note: The schema-based labels available for filtering depends on the class you are currently filtering. Within an Innoslate Requirements Document, you have the option to filter your document’s entities by Class or Label. ‘Filter’ tab of the left sidebar.